A study published today in PLOS ONE reveals that once prime tropical hardwoods - such as Brazilian cedars, ipe (Brazilian walnut), and rosewood - have been logged, they do not grow back to commercial levels and are at risk from disappearing altogether. Lead author Dr Vanessa Richardson, from UEA's School of Environmental Sciences, said: "Slow growing and commercially valuable species of all kinds have been overexploited over the course of human history - just look at the whaling industry or fisheries. 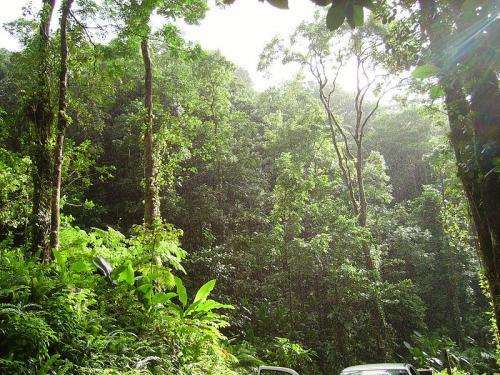 "Yet many tropical timber species are still thought of as a renewable resource. We are only beginning to see over-exploitation parallels in tree species. "Our research shows that many high-value timber species are logged until their populations collapse altogether." Timber harvests in Pará equate to almost half of all native forest roundlog production in Brazilian Amazonia - the largest old-growth tropical timber reserve controlled by any country. Brazil accounts for 85 per cent of all native neotropical forest roundlog production. They found that loggers can no longer depend on areas where high-value species were formerly abundant, to fetch high economic returns. This means that logging operations are continuously forced to extract timber trees from new areas of unlogged primary forests. Prof Carlos Peres, an author on the study from UEA's School of Environmental Sciences, said: "Our analysis shows that even so-called 'reduced-impact logging' in tropical forests can rarely be defined as sustainable in terms of forest composition and dynamics in the aftermath of logging - never mind the greater susceptibility of logged forests to catastrophic fires. "Environmental licensing and market certification of logging concessions need to take this into account, and review minimum preconditions in terms of volumetric quotas of roundlogs harvested per species and regeneration standards over multi-decade logging cycles." After selective logging, there is no evidence that the composition of timber species and total forest value recovers beyond the first-cut. This suggests that the most commercially-valuable timber species become predictably rare or economically extinct in old logging frontiers. Only recent logging operations, which are furthest away from heavy-traffic roads, are the most selective, concentrating gross revenues on a few high-value species. Managing yields of selectively-logged forests is crucial for the long-term integrity of forest biodiversity and financial viability of local industries. Dr Richardson added: "Previous studies in Asian markets suggest that current commercial agreements could lead to 'peak timber' and then widespread economic extinctions across other tropical regions. "Our study adds a Neotropical body of evidence to support this. We can already see a market shift, in which loggers in old depleted logging Amazonian frontiers are forced to depend on fast growing, soft-wood timber species." 'Temporal decay in timber species composition and value in Amazonian logging concessions' is published in the journal PLOS ONE on July 13, 2016. Tropical forests were once grasslands and will be grasslands again..
Well, it makes scary headlines.